The popularity of e-commerce in India is soaring. However, online shoppers in the country are the most hesitant in the world when it comes to buying from foreign websites. Just over half of online shoppers in India are comfortable with the idea of making e-commerce transactions from retailers abroad. This is lower than the global average of two-thirds, according to new research by Flow, a platform for cross-border e-commerce. Flow surveyed around 5,000 people aged between 18 and 54 across 11 countries for this research. “More than one in five shoppers in India were concerned with local payment options not being offered,” Flow’s report said about the country where cash is still king. Cash-on-delivery is still the most favoured payment method in Indian e-commerce as poor digital infrastructure, weak cyberlaws, and lack of consumer trust continue to plague the sector. Moreover, homegrown e-commerce sites offer a lot of payment options, like the digital wallets of Flipkart-owned PhonePe and Vijay Shekhar Sharma’s Paytm, which are not accepted by many foreign sites. Customer service availability was also a high priority—over one in five Indians sampled said so. 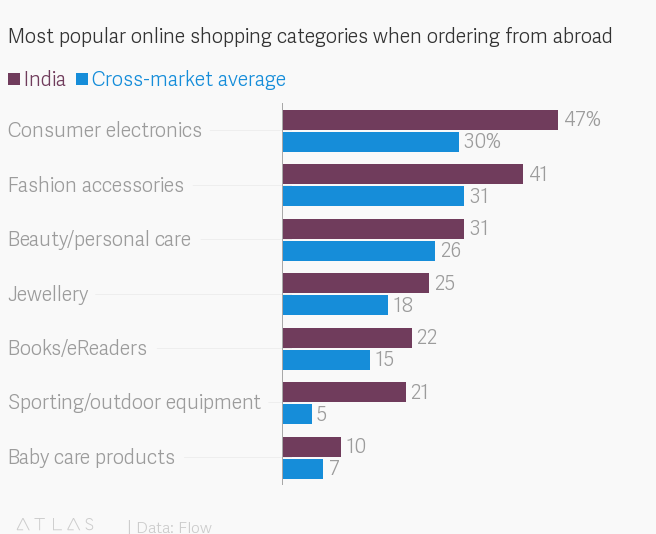 Female shoppers in India are far more inclined to shop online from outside India than their male counterparts. And what are they ordering? “Indian shoppers were more interested in fashion accessories, consumer electronics, jewellery and sporting goods,” the report said. India’s favourite destination to order foreign goods from was the US, followed by China.